My nemesis is dry skin, which is worsened by my eczema and a hometown with 55% humidity. The worst is my hands, with deep cracks and flaky skin, but face is red and dry too. Homemade Eczema Cream by DYI Confessions has been all over Pinterest, so I finally gave a try. It’s a simple mixture of coconut oil, ground oats, olive oil and rosemary. I skipped the rosemary, because I’m pretty sure it would just make me sneeze. Much of the oatmeal does sink to the bottom, so what I did was put it into the fridge until it got good and solid, cut off the layer of oats, warmed up the remaining and then whipped it. I LIKE that it soaks into my skin and that all the ingredients are food, so I’m not worried about ingesting any of it. But I don’t think makingit was worth it. I find the cream very oily. It’s as oily as coconut oil. (duh!) So I had to put gloves until it soaked in, which was actually quite fast. I haven’t seen a remarkable improvement and I have been using it almost every time I wash my hands for the last couple of weeks. I’ll use up the rest of it, but I won’t make it again. If you are lazy but still want to try it, then I suggest using straight coconut oil. If you like that, the go for the whole recipe. But for me, I’ll be using the rest of the oil for cooking. Next I watched Jaclyn Hill’s Skin Care Routine This girl has great videos and she inspired me to do up my makeup. But of course my “canvas” needs some help, so I watched her skin care video and I borrowed two of her home remedies. I exfoliated with sugar. 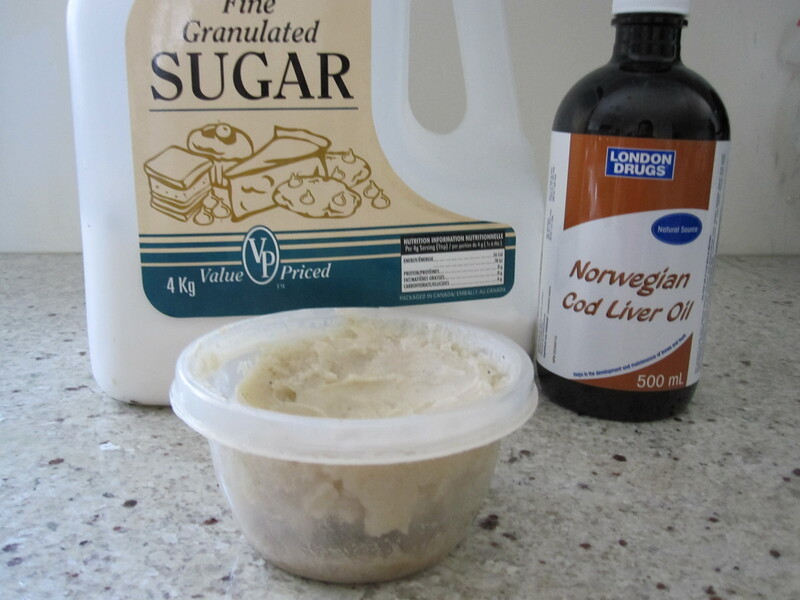 And I started taking Norwegian Cod Liver Oil (why Norwegian?). I couldn’t find any with lemon, and this stuff tastes just like it sounds, awful! Just be sure to chase it with something strong like orange juice or tequila. I also started putting some of the eczema cream on my really dry spots, especially between the eyebrows. My face hasn’t looked this good in ages. It’s smoother and not flaky. I don’t know if it’s the Cod Liver Oil or Coconut Oil Eczema Cream (I’m pretty sure it’s not the sugar scrub I did only did once). But when I run out of the Cod Liver Oil, I am definitely NOT going to run out and get some more(bleh! ), unless my face tells me to, and then maybe I’ll see if it comes in a capsule.